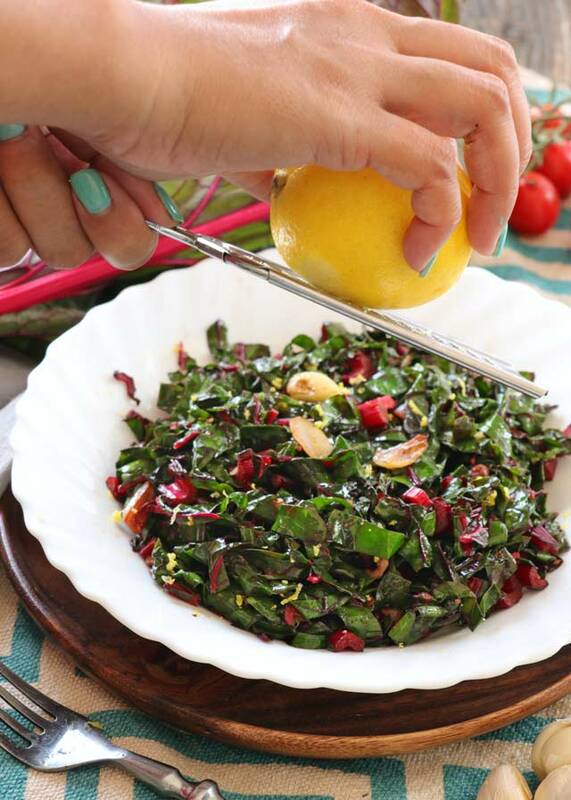 A very simple but tasty Swiss Chard recipe that will keep you fit and healthy. Simply sauteed in olive oil with lots of garlic with an added tang from lemon zest. 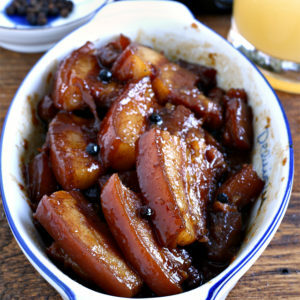 Perfect as a vegetable side dish to your fish or meat. Every time we have someone visiting us for the first time in our new home, Armin and would give them a quick tour of the house. The last part of the tour (and my favorite part) will be to my vegetable garden. The most common question we get is, “what is that?” pointing at my red chard plants. Yes, I am a plant mom and very proud of all my babies. 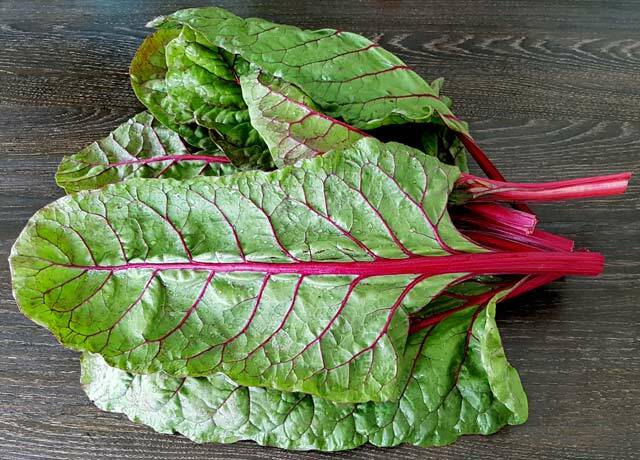 But the Swiss Chard usually takes all the attention with its big deep green leaves bright red stalk, that is very exotic here in the Philippines. I was not entirely sure it will grow here in the tropics but I decided to give it a try anyway. Much to my surprise and delight, it is actually thriving well since I planted it from the seeds that I brought with me from Germany. Now it is time to cook it. I harvested some stalks and decided to make a simple dish of sauteed Swiss Chard to have it as a side to the equally tasty Soy-Honey-glazed Salmon. They were a match in heaven! Red Swiss Chard freshly picked from my garden. 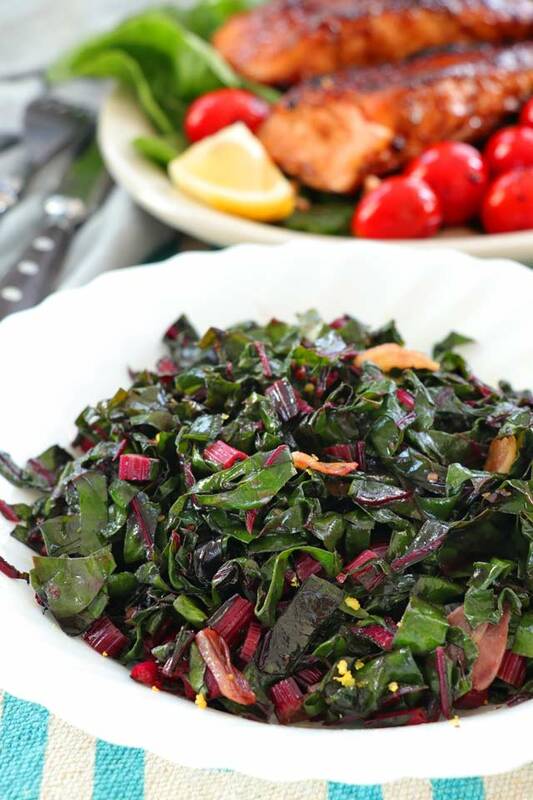 Chard or Swiss chard is a green leafy vegetable that belongs to the family (Chenopodiaceae) of beets and spinach. Although the leaves are usually deep green in color, the stalk can have different colors depending on the variety. The red chard has red stalk and veins. There is also a rainbow chard variety that sports a mix of brightly colored stalks. Contrary to what you may think, Swiss Chard did not originate from Switzerland but is rather native to the Mediterranean. Other names for it are: silverbeet, perpetual spinach, spinach beet, crab beet, bright lights, seakale beet, and Mangold. Swiss Chard is very nutritious. It is, in fact, one of the most healthy vegetables you can eat. A nutritional powerhouse indeed. A good source of Antioxidants that prevents liver diseases. Helps lower high blood pressure as it contains trace minerals that are needed to promote circulation, blood vessel health, as well as heartbeat regulation. An excellent source of vitamins K, A, and C, as well as a good source of magnesium, potassium, iron, and dietary fiber. Helps treat or prevent Anemia. It is rich in iron that enhances the production of red blood cells. How does Swiss Chard taste? It is a cross between beetroot and spinach. The stalk has the earthy taste similar to beets, while the leaves are very similar to spinach in both flavor and appearance. The leaves are tender and the stalks are usually crunchy especially when harvested early. Some people may find the leaves to have a very slight hint of bitterness. 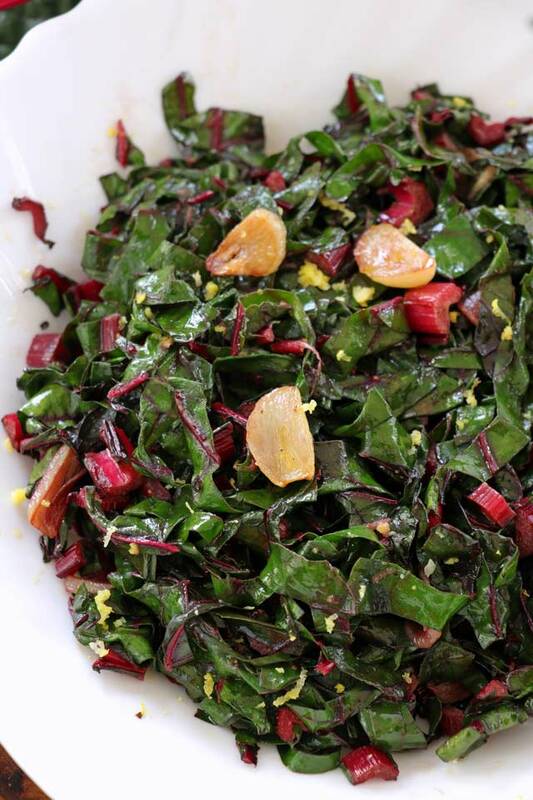 How to cook Swiss chard? 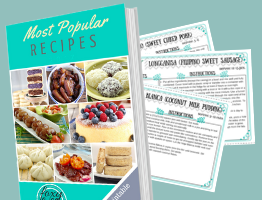 There are many Swiss Chard recipes to choose from and so many things you can make from this nutrition powerhouse of a vegetable. It can be eaten raw and does not wilt quickly so it also makes a good addition to salads. It is also perfect for making gratin and omelet. Separate the stalks with the leaves by cutting with a knife or tearing it with hands. Cut the stalks into 1/4-inch long pieces. Stack the leaves together and fold to make it easier to cut. Cut also into small strips. Heat oil in a large skillet and sautee slices of garlic until aromatic. Stir in the chopped Swiss Chard and cover in oil. Season with salt and pepper and cook uncovered until wilted. Add some lemon zest if desired. The garlicky and lemony flavors of this Sauteed Swiss Chard complemented the sweet and salty goodness of the Soy-Honey-glazed Slamon very well. I also love the crunchiness of the chard’s stalk that made the whole meal quite enjoyable. Both dishes were also a breeze to make, a side and a main all in less than 20 minutes to prepare and cook. Now that is my perfect meal. Healthy and delicious, this Sauteed Swiss Chard is super quick and easy to make. Perfect side to your favorite fish with lemony and garlicky flavors. Wash the Swiss Chard thoroughly with water. Separate the stalks with the leaves by cutting with a knife or tearing it with hands. Cut the stalks into 1/4-inch long pieces. Stack the leaves together and fold to make it easier to cut. Cut into small strips. Heat oil in a large skillet over medium heat. Saute slices of garlic until aromatic and slightly browned. Season with salt and pepper and cook uncovered until wilted,about 3-4 minutes. Add some lemon zest and toss once more. Turn off heat and transfer to a serving dish. Note 1: If using mature chard, saute the stalks pieces first for a minute before adding the leaves so they can cook at the same time.